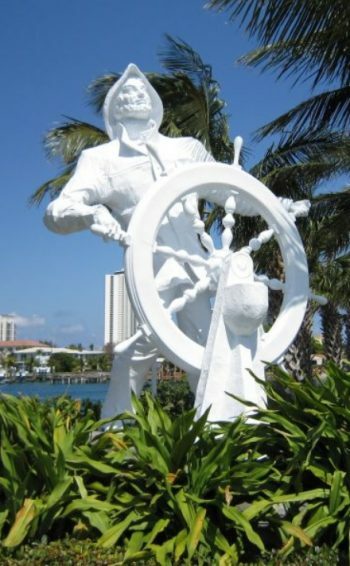 Earl LaPan’s statue, “The Mariner”, located in Phil Foster Park in Riviera Beach, Florida. His work as an artist came to a brief pause during World War II when he entered the U.S. Army Air Corps in October 1943. 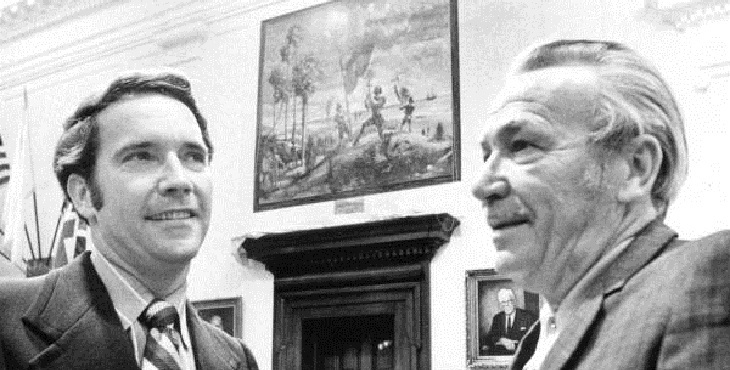 When the war ended, LaPan returned to Florida and resumed creating works of art. He began designing sculptures to go on display throughout the region. LaPan created an iconic piece in 1962 for First Federal Bank in Lake Park, Florida. The sculpture depicted two bucking horses, each standing at 10 feet tall. It became a notable landmark and earned First Federal Bank the nickname of “horse bank.” By 2005, the sculpture’s condition had deteriorated and was in need of repair. However, before repairs began one of the horses fell during a storm, prompting a complete replacement of the piece within a year. He finished his most notable statue, “The Mariner,” in 1978 for the First Marine Bank. The 14-foot statue is modeled after the bank’s founder, Jerry Thomas, who served as Florida Senate President. The bank closed five years later in 1983, and the statue was moved to Phil Foster Park in Riviera Beach, Florida where it remains today. Earl LaPan passed away at the age of 97 on February 19, 1996. Today, he is memorialized at Florida National Cemetery in Bushnell, Florida. Grave marker for Cpl. 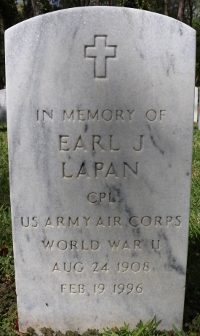 Earl J. LaPan at Florida National Cemetery in Bushnell, Florida. Please join us in honoring Cpl. Earl LaPan. We commemorate our Veterans to ensure that their memory never fades and that their legacy never dies. Ken Holliday is part of the Veterans Legacy Program at the National Cemetery Administration. He is a proud Army Veteran, having served in the Infantry with combat deployments in both Iraq and Afghanistan. Thank GOD that these Veterans are not forgotten!